Managed the redesign and relaunch of olympic.ca & olympique.ca. I continue to manage Olympic.ca, including quality control, measurement, reporting, content implementation and user experience. Our vision was to create a website that can be best-in-class amongst global NOCs; a site that is stable enough to weather the wave of fan traffic that will come with Sochi and Rio; a site that is modern, fast, easy-to-use, and mobile-friendly. We re-launched olympic.ca in August 2013 and we continue to make ongoing improvements (including a homepage redesign in January 2014 to account for our increase in post volume and other Sochi considerations). Modern, mobile-first design: By 2014, mobile consumption is predicted to overtake desktop. 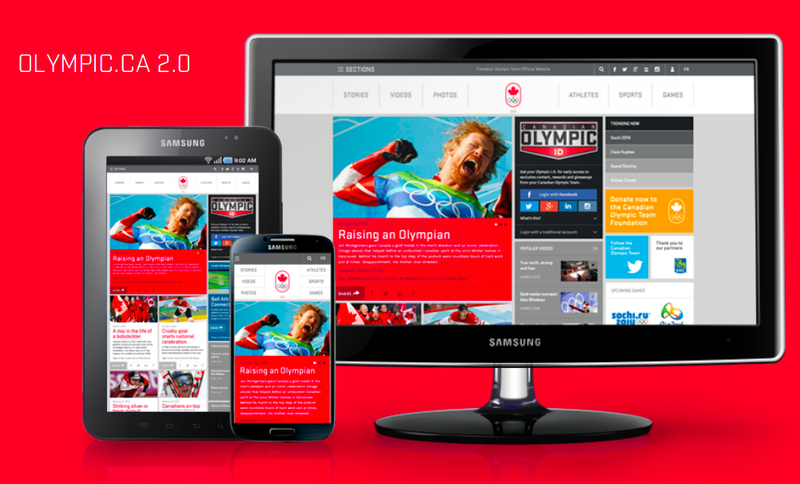 As such, Olympic.ca has been redesigned from the ground up as a mobile-first property: it uses responsive development, which means that the site literally responds to the screen dimensions of the device it’s being displayed on, creating superior experiences from one site, regardless of screen size. We have also adopted a minimalist, clean and flat design style ­ again to work well on mobile, and for performance reasons. Simplified Navigation: Menu systems designed for mobile screens, with focus on core areas of highest fan interest. Built to be shared: Inclusion of prominent social sharing capabilities, encouraging fans to spread our content. Enhanced French version: French now has its own domain name: Olympique.ca. French historical content undergoing a complete audit. One-site strategy: Merging all existing sites into a single entity, including Education and Foundation websites.